When my daughter, Jenny, is living in her home in nearby Chandler, I come by to visit each week to play with my grandbabies and visit with my older grandson, as well as with her, of course. But she spends summers in Key West (which is hot in summer to be sure, but 40°F less than it gets in Phoenix). And so she generously sends me to visit then as well. This section documents and displays the adventures we had in the Conch Republic. Technically, I arrived yesterday. But my flight arrived so late that I had time for just a brief peek at the babies before retiring to my motel. Today&apos;s adventures included a visit to the Butterfly Conservatory and a swim at Higgs Beach. Although we were unable to visit Higgs Beach yesterday due to high winds, today the weather was more clement. However, we decided to start off with a visit to the Butterfly Conservatory. 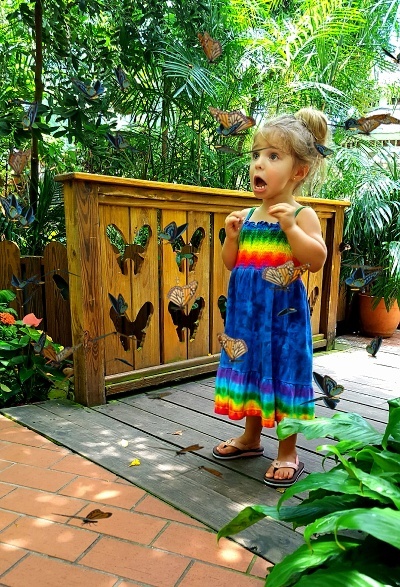 Gianna loves butterflies (her room is decorated with them) and I love seeing her love butterflies, so she and I were both looking forward to the experience. Today&apos;s beach adventure was at the other side of the island, specifically, the beach at Fort Zachary Taylor Historic State Park. Gianna loves animals, so a visit to the semi-monthly sheriff&apos;s special animal program is a natural. With all the problems that have been cropping up with police murders of minorities, it is with the greatest pleasure I can point to the Sheriff of Florida&apos;s Monroe County as a person whose constituents can point with pride as being what a cop should be. I say this based on one thing: The Monroe County Sheriff&apos;s Animal Farm. I put the finishing touches on my sunburn as we take the grandchildren to an uninhabited island. I&apos;m the Professor. Jenny let me know last night that we would be taking out her new boat today, and to plan an early start. Thus I was up at 7 AM (5 AM Arizona time) and at her house by 8. By 9:30, everyone thing was packed and the babies were ready and we went to the Marina to pick up the boat. Sunburned but happy after a week&apos;s fun with the babies, it&apos;s time for my return home. This was to be my last day in Key West, as my flight would leave in the evening. I packed up my stuff and loaded Jenny&apos;s car with it so I could check out and then get breakfast. (The motel had breakfast but it wasn&apos;t quite up to soup kitchen quality, so I grabbed and bacon-egg-cheese croissant at Burger King. (Excuse me, "Croissan&apos;wich".) The last chore I wanted to accomplish before going to Jenny&apos;s: taking photos of the exterior of the houseboat on which I broke my leg in two places, on my previous trip.